Here is our list of best truth or dare questions for college students. You should try these questions when you are playing truth or dare game with your friends in college. 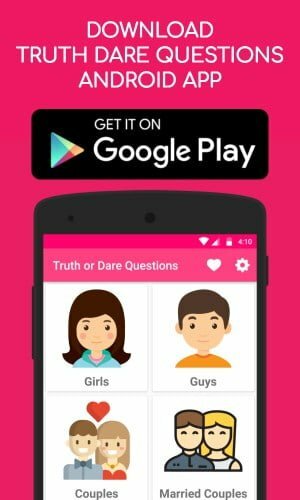 Enjoy our truth or dare questions for college students and have fun. Have you ever try to steal your college computer system parts? How many times have you cried in the swimming pool? Do you like to party with your professor or teacher? What’s your opinion on love at first sight? Have you ever had a crush on anyone? Have you ever propose in campus/ library? How many times do you watch a movie without knowing your parents? Have you ever hurt someone without their mistake? Have you ever fight with someone for your crush? Have you ever watched a boaring movie with your best friend? Which celebrity would you like to a selfie? Have you ever worn same socks for more than 5 days without washing them? Have you ever tried to eat plenty of chips in a single day? Hope you like our list of best truth questions for college students. If you know any other truth questions for college students, do let us know in the comment section below. Purpose someone in front of your teachers. Sing and dedicate a song to your crush in front of your friends. Say “I Love You” in 10 different languages. Dance in front of your teacher for 2 minutes. Do and explain any 5 yoga postures. Dip all your fingers in sauce and clean them without tissue and water. Call to any teacher in your college. Sit on your friend’s lap for one hour in your classroom. Stare the next person who enter’s into the classroom for 2 minutes. Do any 5 gymnastic poses in your college classroom. Sing a sad song in a funny way. Eat any two of your best friends lunch boxes. Do a funny dance in front of your friends and make them laugh. Praise a boy/girl in your class without mentioning his/her name. Hope you like our list of best truth or dare questions for college students. If you know any other truth or dare questions for college students, Let us know in the comment section below.